Asfordby is a village and civil parish in the Melton district of Leicestershire, to the west of Melton Mowbray on the A6006 road. 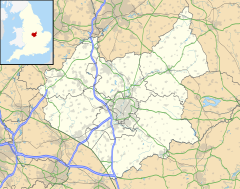 The parish consists of Asfordby proper, Asfordby Valley and Asfordby Hill, which together have a population of around 3,000 (1995 est).The population had increased to 3,286 at the 2011 census. The villages are to the north of the River Wreake, with Asfordby Hill situated east of Asfordby proper, closer to Melton, and Asfordby Valley to the north. Within Asfordby proper, there are a few shops, mainly convenience shops. However you can find a Fish & Chip shop, an Indian restaurant, as well as a kitchen store and a Co-operative shop. Asfordby was the site of a modern deep coal pit which was built between 1984 and 1993, but this closed in 1997 due to numerous geological difficulties and the low price of coal at the time. The original Old Dalby test track is owned by BRB (Residuary) Ltd. and runs from Melton Mowbray via Asfordby to Edwalton. In the early 2000s it was leased to Alstom Transport Limited who upgraded and electrified the line and used it for testing the UK version of Pendolino tilting trains. After completion of the Pendolino testing in early 2005 the line was mothballed. On 12 February 2007, Metronet announced that they had leased the track and would be refitting part of it to test the next generation of air conditioned tube trains. The Alstom Midlands Test Centre (AMTC) HQ now occupies various buildings at the former mine complex at Asfordby. ^ "Civil Parish population 2011". Neighbourhood Statistics. Office for National Statistics. Retrieved 5 June 2016. ^ "Metronet saves Old Dalby test track" (Press release). Metronet Rail. 12 February 2007. Retrieved 20 March 2007. ^ BBC (19 March 2007). "Tube firm to use rail test site". BBC News. Retrieved 20 March 2007. This page was last edited on 9 October 2018, at 13:54 (UTC).